We are one of the widely acclaimed manufacturers, exporters, suppliers, importers, wholesalers and traders of Orbital Welding Services. 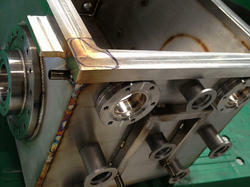 The offered orbital welding machines are widely used for the tubing and piping jobs. Our supplied orbital welding machines are acclaimed for genuine electrodes which ensure long lasting welded joints in the pipe network. The offered orbital welding machines employ the computer process which rotates the arc at three sixty degrees, around the work piece. Looking for Orbital Welding ?